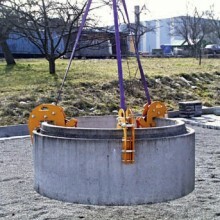 Manhole and Cone Chain Clamp, extremely easy handling and light-weight. Automatically adjustable clamping range of the claws to the thickness of the pipe walls. Do you require a 3 legged chain sling? Just click the button below.